The incidence of melanoma increased steadily over the past four decades. The main cause of death of melanoma patients is the widespread metastases of cancer to organs such as liver, lung, brain, bone, and lymphatic system. Historically, the major treatment option for treating metastatic melanoma is chemotherapy using drugs such as dacarbazine, temozolomide, fotemustine, or taxanes., However, these chemotherapeutic approaches are focused on reducing the tumor burden and alleviating the symptoms rather than increasing the survival. For example, dacarbazine therapy which is considered as a standard of care induces response rates anywhere between 5% and 25% and does not improve the overall survival (OS) in comparison to the supportive care (5–11 months). The average survival of the metastatic melanoma patients under chemotherapy is 6–12 months with a 5-year survival rate under 10%., Thus, the lack of proper therapies for the treatment of metastatic melanoma spurred great interest in researchers to find novel therapies. Recent understanding of the molecular signaling pathways in the tumor microenvironment (TME) led to discovery of agents that target the tumor directly (targeted therapies) or agents that unleash the immune system potential to fight cancer (Immunotherapies). These agents have dramatically enhanced the treatment options for metastatic melanoma patients. The targeted therapies approved after 2011 includes vemurafenib, dabrafenib, and trametinib.,, The immunotherapeutic drugs approved are ipilimumab, pembrolizumab, and nivolumab. Immunotherapy for metastatic melanoma focuses on enhancing the tumor-specific immune system by blocking the checkpoints of the immune system. Immune checkpoints refer to plethora of immunosuppressive pathways hard wired into the immune system to modulate the durability and amplitude of physiological immune responses to antigens so as to promote self-tolerance and prevent collateral tissue damage., It is now clear that tumor cells utilize these pathways to their advantage and prevent buildup of immune response (particularly T-cell responses) against them. The major inhibitory pathways identified are cytotoxic T lymphocyte antigen 4 (CTLA-4) pathway, and PD-1 pathway and both are initiated by ligand-receptor interactions and thus can readily be blocked by antibodies against them.,,,, In particular, ipilimumab inhibits CTLA-4 whereas pembrolizumab and nivolumab inhibit PD-1 pathway. The approval of these agents raised the field of immunotherapy to the ranks of chemotherapy, surgery, and radiation as a pillar of cancer therapy. Nivolumab which is the main focus of this review is found to drive antitumor responses against metastatic melanoma and other cancers such as renal carcinoma, nonsmall cell lung cancer (NSCLC), and Hodgkin's lymphoma., The current article reviews the immunotherapeutic approaches leading to discovery of nivolumab and its potential in treating melanoma. Early immunotherapy approaches to treat metastatic melanoma revolved around infusion of cytokines such as interleukin-2 (IL-2) and interferon-γ. IL-2 is a pro-inflammatory cytokine with immunomodulatory activities and is approved by the Food and Drug Administration (FDA) in 1998., High doses of IL-2 showed durable (>3 years) immune responses in 6%–8% of patients but was also associated with toxicities such as fever, hypotension, cardiac arrhythmias, and multiorgan dysfunction.,, Interferon-γ treatment when given to metastatic melanoma patients after tumor resection showed an improved relapse-free survival. However, the OS is only moderate with a relative improvement of 10% but is often associated with chronic and dose-limiting toxicities.,,,,, Although these early immunotherapy options have shown some signs of treating the metastatic melanoma, they did not exhibit a long-term survival benefit. CTLA-4 is the first immunosupressor/immune checkpoint that is clinically targeted, is expressed exclusively on the surface of T cells, and is involved in regulating the amplitude of early events of T cell activation in lymphoid organs. CTLA-4 counteracts the activity of CD28, a T cell costimulatory receptor that interacts with B7.1/B7.2 of antigen presenting cells (APC) after initial engagement of T-cell receptor with cognate antigen on APC.,,,,,, Thus, CTLA-4 prevents B7.1/B7.2-CD28 interaction that is crucial for continuous tumor antigen-specific T-cell activation., Antibodies that target CTLA-4 (ipilimumab) inhibits CTLA-4 engagement with B7.1/B7.2, which will facilitate normal costimulatory events of T-cell activation leading to buildup of a robust immune response (particularly cytotoxic T-cell response) specific to tumor antigens. The clinical experiences and lessons learned from ipilimumab therapy have enhanced the research interest in targeting other tumor immunosuppressive pathways leading to subsequent development of pembrolizumab and nivolumab. Both pembrolizumab and nivolumab target immunosuppression caused by interaction of immune checkpoints programmed death 1 (PD-1) and programmed death-ligand 1 (PD-L1). PD-1 is a surface receptor expresses mainly on immune cells such as CD4+ and CD8+ T cells, B cells, and natural killer cells whereas its ligand PD-L1 (also PD-L2) expresses mainly on tumor cells.,,,,, These interactions have immunosuppressive effects leading to T-cell exhaustion in the TME characterized by T-cell apoptosis, decrease in T-cell proliferation, and decrease in release of cytokines such as IL-2 and interferon-gamma [Figure 1]a.,,,,,, Physiologically, T-cell exhaustion events are the result of PD-1 overexpression on T cells during T cell-antigen interaction and are found to play a significant role in inhibiting prolonged activation of immune cells after the antigen is removed successfully. Thus, PD-1 expression is required to inhibit immune cells from attacking normal tissues (autoimmunity) and to promote immune tolerance. However, tumor cells exploit this mechanism by promoting the T-cell exhaustion events through overexpression of PD-L1 and consequently inhibiting the buildup of robust antitumor immune responses. Recent understanding of this PD-1/PD-L1 inhibitory pathway paved the way for the accelerated development of antibodies that target PD-1 or PD-L1 leading to FDA approval of two antibodies pembrolizumab and nivolumab that target PD-1. Many antibodies such as durvalumab (MEDI4736) and MPDL3280A were designed to block PD-L1 and are in clinical stages of investigation against several other malignancies., Studies on efficacy of PD-1-targeted therapies on NSCLC patients suggested a need for high CD28 expression for CD8 T-cell responses. This would help in determining the patient populations that may benefit from treatment, although specific studies are needed to test the applicability for metastatic melanoma patients. 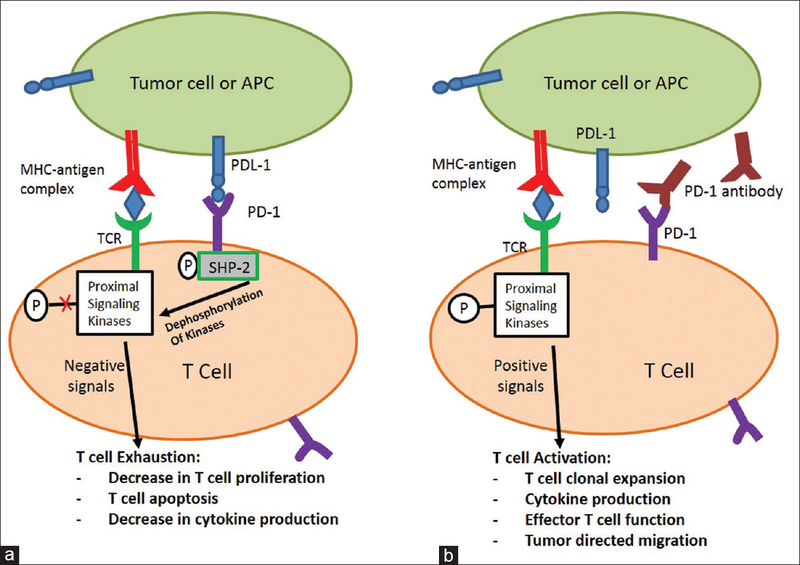 Nivolumab is a fully human IgG4 antibody which specifically binds to PD-1 and releases the immune system brakes applied through PD-1/PD-L1 pathway [Figure 1]b. PD-1 is principally believed to act on the effector phases of T cells in the TME on chronic antigen exposure and thus antibodies blocking PD-1 are thought to deliver quick and specific antitumor responses with fewer side-effects. Compared to PD-1, CTLA-4 acts systemically at secondary lymphoid tissues mainly during early events of T-cell activation and locally in the TME. The local responses of CTLA-4 antibodies at TME is mainly through inhibiting suppressive responses of CD4 positive T regulatory cells in the TME.,, PD-1 plays subtle roles in peripheral immune tolerance and PD-1 knockouts are well tolerated in mice., However, CTLA-4 plays more active roles in immune tolerance and CTLA-4 knockout mice exhibit hyperproliferation of lymphocytes leading to more T lymphocyte infiltration and organ failure., Thus, it is hypothesized that inhibition of the PD-1 inhibitory pathway by specific antibodies such as nivolumab are better tolerated than CTLA-4 blockade by ipilimumab. Initial Phase I clinical trial with nivolumab against melanoma is performed on 94 patients at doses of 0.1, 0.3, 1, 3, and 10 mg of nivolumab/kg body weight for every 2 weeks. Among the treated patients, 28% (26 of 94) reached an objective response rate (ORR). The ORR was highest at 41% (7 out of 17) for patients from 3 mg/kg treatment cohort. Among the 26 patients with ORR, 18 patients received treatment for >:1 year, and 13 of them showed durable response even after 1 year. The rest of the eight patients received treatment for less than a year among which 6 showed objective response ranging from 1.9 to 5.6 months. The long-term survival among all the dose cohorts is found to be 63%, 48%, 42%, and 42% after 1, 2, 3, and 4 years. The major toxic side effects of the treatment include nausea, decreased appetite, pruritus, and diarrhea. Immune-related side effect such as severe pneumonitis is also occurred in six patients., Overall, the treatment showed impressive antitumor responses with manageable side effects. Nivolumab was further tested in a second Phase I trial on 90 Stage 3 or Stage 4 refractory metastatic melanoma patients that were either ipilimumab naïve (never received ipilimumab but had received other chemotherapies) or received previous ipilimumab treatment. Nivolumab was given to both cohorts at 1, 3, and 10 mg/kg at 2 weeks interval for a total of 24 weeks, along with or without a multipeptide vaccine. Nivolumab was found to be safe and tolerable with or without multipeptide vaccine in both ipilimumab refractory and ipilimumab naïve patients. About one-quarter of the total patients showed ORR irrespective of the prior treatment. Tumor regression was found to be starting as early as 5 weeks after the treatment. Five of the patients showed minor toxicity symptoms and are recovered after corticosteroid treatment. The patients showing objective responses were both positive and negative for PD-L1 expression, although the responses were higher against PD-L1 expressing tumors. Responses were also not specific to presence or absence of a common metastatic melanoma mutation in BRAF encoding proto-oncogene. Mutations in BRAF encoding proto-oncogene is common in 50% of melanomas and the fact that nivolumab works in both wild-type and mutated BRAF (most commonly BRAF V600E) was considered as a promising sign for the future potential of nivolumab. A large Phase III study involving 90 sites in 14 countries was performed to test nivolumab therapy in advanced melanoma patients with metastasis progressed after ipilimumab immunotherapy or ipilimumab and BARF inhibitor therapy. The patients were administered with either nivolumab (3 mg/kg every 2 weeks) or other chemotherapy options such as dacarbazine or carboplatin or paclitaxel. Nivolumab administered patients showed a better response with an ORR of 31.7% compared to 10.6% response for chemotherapy. The ORR observed with nivolumab are irrespective of patients BRAF mutations, previous benefits of ipilimumab, and presence of poor prognosis factors. In addition, the responses were observed in both PD-L1 positive and negative melanomas, although the responses were greater with 44% in PD-L1 positive compared to 22% in PD-L1 negative melanomas. The median time for the response was 2.2 months for nivolumab and 3.5 months for chemotherapy. Notably, the adverse events were less severe with nivolumab and were easily manageable. Drug toxicity caused treatment discontinuation in only 2% of nivolumab-treated patients compared to 9% in the chemotherapy. In addition, Grade 3 or Grade 4 side effects were only 9% for nivolumab but 31% for chemotherapy. Overall, nivolumab showed an astounding response rate and was very well tolerated than did chemotherapy. Based on these results, US FDA has given accelerated approval for nivolumab on December 22, 2014, for treating patients with unresectable metastatic melanoma with the disease progressed even after previous ipilimumab therapy and with BRAF V600E mutation. Another Phase III trial was performed on previously untreated melanoma patients without BRAF mutation. Patients were treated with nivolumab or dacarbazine therapy and observed for ORR and adverse events. The patients treated with nivolumab showed an OS rate of 72.9% and was significantly much higher than 42.1% noticed for dacarbazine after 1 year. The ORR was found to be 40% (nivolumab) versus 13.9% (dacarbazine), and the progression-free survival (PFS) was 5.1 months (nivolumab) versus 2.2 months (dacarbazine). The toxic profiles for nivolumab were similar to the ones observed in previous trials with majority of them being nausea, fatigue, pruritus, and diarrhea. Grade 3 or Grade 4 adverse events with nivolumab was less severe (11.7%) when compared to chemotherapy (17.6%). This trial proved the effectiveness of using nivolumab as a first-line therapy for metastatic melanoma. Nivolumab therapy has resulted in durable and tolerable responses in many metastatic melanoma patients. However, the treatment is only helping ~30% of the patients and thus still challenges physicians to predict whether or not nivolumab therapy is best for any patient. Currently, an exciting area of work is to search for biomarkers that would help us to identify patient population that may benefit from the nivolumab treatment. Since nivolumab works by binding to PD-1 and inhibiting PD-1 interaction with PD-L1, it was hypothesized that the expression of PD-L1 in tumor tissues may serve as a biomarker for successful patient response to nivolumab. To test this scenario, immunohistochemistry for tumor samples was performed to identify PD-L1 positive tumors in advanced melanoma patients in Phase I trials and the ORRs were observed after treatment with nivolumab. The results showed zero ORR to nivolumab treatment in 17 PD-L1-negative patients while 9 of 25 PD-L1 expressed patients responded to the treatment. In another Phase II trial, a statistically significant association of PD-L1 expression and positive nivolumab response was achieved with 67% of PD-L1-positive patients showing ORR, although PD-L1-negative patients still responded with 19% ORR. These results indicate that PD-L1 negative tumors can respond to nivolumab treatment and thus complicate the presence of PD-L1 as the only scenario for administering nivolumab therapy. In addition, PD-L1 expression is dynamic and is affected by multiple factors leading to more complications in deciding PD-L1 as biomarker for a response., Studies from NSCLC patients treated with PD-1 therapy suggested the need for CD28 expression for expansion of PD-1 positive CD8 T cells, adding another angle to consider for a successful therapy. Therefore, at this point, a further investigation is needed to consider PD-L1 expression as biomarker for decision-making on nivolumab therapy. The next frontier in the immunotherapy is combination therapy including if and how to combine immunotherapy with chemotherapy or other immunotherapy drugs. Combination therapies that provide rapid and substantial tumor regression would undoubtedly revolutionize the melanoma treatment. Given the potential benefits, nivolumab is being investigated in combination with chemotherapies, immunotherapies, and vaccine-based therapies such as dendritic vaccines, NY-ESO-1, and Tri-Mix in advanced melanoma patients. A combination therapy involving nivolumab and ipilimumab was considered promising based on rapid and durable immune response in pre-clinical and clinical trials., Phase I studies receiving this combination therapy of ipilimumab and nivolumab demonstrated a tumor regression in ~50% of metastatic melanoma patients with 85% of patients surviving even after 1 year of the treatment. In addition, the response rates were found to be similar irrespective of BRAF mutation and PD-L1 expression. The combination therapies proved to be more effective than either of the individual therapies, although higher Grade 3–4 adverse effects than individual monotherapies. Based on the exciting data obtained from ipilimumab and nivolumab combination therapy, Phase III trials are being conducted. Several other combinations involving immunotherapy alone or immunotherapy and chemotherapy are being investigated in clinical trials. A detailed list of these therapeutic agent combinations is provided in [Table 1]. The information gained from these trials would hopefully help guide the physicians to choose best-treatment choices in the near future. Although majority of the adverse events associated with nivolumab are less severe and manageable, some events are life-threatening and thus demands a thorough understanding of the potential side effects so as to manage them effectively.,,, Awareness on the potential PD-1 therapy side effects would help physicians in avoiding delays in diagnosis and treatment. The common side effects observed from various trials include nausea, diarrhea, decreased apatite, pruritus, and pneumonitis. Grade 3–4 adverse events were usually noticed in 5%–10% of patients while the same is around 22%–24% for ipilimumab treatment. Severe adverse events leading to abandoning of the therapy is in ~5% of the patients. Some severe side effects also emerge after cessation of the therapy including severe skin reactions, diabetes mellitus, acute heart failure, myositis, and rhabdomyolysis. In another retrospective study, Eigentler et al. in 2016 summarized the safety data of immune-related toxicities for both nivolumab and pembrolizumab using publicly available assessment reports from US FDA and European medicines agency. The toxic profiles for both drugs are similar with major adverse events being mild-to-moderate (Grade 1–2) and with idiopathic Grade 3–4 events ≤2% for any event term. Adverse events such as dermatological (Grade 3–4: 0.8%) gastrointestinal (Grade 3–4: 1.6%), pulmonary (Grade 3–4: 2%), endocrine (Grade 3–4: 1%), and renal and hepatic (Grade 3–4: 1%) toxicities were noticed. The onset of adverse events varies anywhere from 1 to 6 months after the treatment, and many of them are reversible with treatment irrespective of their time of onset. Many of the adverse events are manageable by the use of glucocorticoids. Some preclinical toxicity studies have showed that nivolumab causes embryological toxicity. Thus, it is not recommended for pregnant women, and contraception is recommended for 4–5 months after the final dose of treatment. Before the approval of nivolumab by FDA for unresectable or advanced metastatic melanoma, another PD-1 inhibitor pembrolizumab was also approved by FDA in September 2014 for the same indication. Just like nivolumab, pembrolizumab is also a fully human IgG4 PD-1 specific antibody and showed similar efficacy and safety profiles in clinical trials. In brief, the initial Phase I trials were done on patients refractory to ipilimumab treatment with 2 mg/kg and 10 mg/kg pembrolizumab treatment at every 3 weeks. The pembrolizumab treatment was effective with an overall ORR of 26%. Successful initial trial led to a Phase II clinical trial, in which an ORR of 21%–25%, and PFS of 34%–38% was noticed. Finally, Phase III trial demonstrated a prolonged 1-year survival of 72.1%, PFS survival at 47.3%, and Grade 3 or 4 toxicities in 13.3% of patients. Improvements in understanding of the biology of tumor immune regulatory pathways are rapidly evolving the treatment choices for metastatic melanoma. Immune checkpoint PD-1 blockade by nivolumab would be an attractive option because of the durable antitumor immune responses and low adverse events compared to the currently available targeted and immunotherapies. The overall patient response rate for nivolumab is found to be 32% and is much higher than other metastatic melanoma therapies (for example, patient response rate to ipilimumab therapy is 10%–15%). The clinical validation and favorable toxicity profile of nivolumab will drive researchers to further test its potential in combination of other targeted therapies as well as immunotherapies. Identification of good combination partners to build a rapid and effective antitumor response and identification of biomarkers to assist in better judgment on the use of nivolumab would be of future interests in nivolumab therapy. Garbe C, Terheyden P, Keilholz U, Kölbl O, Hauschild A. Treatment of melanoma. Dtsch Arztebl Int 2008;105:845-51. Middleton MR, Grob JJ, Aaronson N, Fierlbeck G, Tilgen W, Seiter S, et al. Randomized phase III study of temozolomide versus dacarbazine in the treatment of patients with advanced metastatic malignant melanoma. J Clin Oncol 2000;18:158-66. Agarwala SS. Current systemic therapy for metastatic melanoma. Expert Rev Anticancer Ther 2009;9:587-95. Balch CM, Gershenwald JE, Soong SJ, Thompson JF, Atkins MB, Byrd DR, et al. Final version of 2009 AJCC melanoma staging and classification. J Clin Oncol 2009;27:6199-206. Michielin O, Hoeller C. Gaining momentum: New options and opportunities for the treatment of advanced melanoma. Cancer Treat Rev 2015;41:660-70. Eggermont AM, Robert C. New drugs in melanoma: It's a whole new world. Eur J Cancer 2011;47:2150-7. Zhu Z, Liu W, Gotlieb V. The rapidly evolving therapies for advanced melanoma – Towards immunotherapy, molecular targeted therapy, and beyond. Crit Rev Oncol Hematol 2016;99:91-9. Korman AJ, Peggs KS, Allison JP. Checkpoint blockade in cancer immunotherapy. Adv Immunol 2006;90:297-339. Topalian SL, Drake CG, Pardoll DM. Immune checkpoint blockade: A common denominator approach to cancer therapy. Cancer Cell 2015;27:450-61. Homet Moreno B, Parisi G, Robert L, Ribas A. Anti-PD-1 therapy in melanoma. Semin Oncol 2015;42:466-73. Hughes PE, Caenepeel S, Wu LC. Targeted therapy and checkpoint immunotherapy combinations for the treatment of cancer. Trends Immunol 2016;37:462-76. Shin DS, Ribas A. The evolution of checkpoint blockade as a cancer therapy: What's here, what's next? Curr Opin Immunol 2015;33:23-35. Koppolu V, Vasigala VK. CTLA-4 antibodies in cancer immunotherapy. MOJ Immunol 2016;3:00092. DOI: 10.15406/moji.2016.03.00092. Johnson DB, Peng C, Sosman JA. Nivolumab in melanoma: Latest evidence and clinical potential. Ther Adv Med Oncol 2015;7:97-106. Gunturi A, McDermott DF. Nivolumab for the treatment of cancer. Expert Opin Investig Drugs 2015;24:253-60. Rosenberg SA, Yang JC, Topalian SL, Schwartzentruber DJ, Weber JS, Parkinson DR, et al. Treatment of 283 consecutive patients with metastatic melanoma or renal cell cancer using high-dose bolus interleukin 2. JAMA 1994;271:907-13. Kammula US, White DE, Rosenberg SA. Trends in the safety of high dose bolus interleukin-2 administration in patients with metastatic cancer. Cancer 1998;83:797-805. Atkins MB, Lotze MT, Dutcher JP, Fisher RI, Weiss G, Margolin K, et al. High-dose recombinant interleukin 2 therapy for patients with metastatic melanoma: Analysis of 270 patients treated between 1985 and 1993. J Clin Oncol 1999;17:2105-16. Schwartzentruber DJ. Guidelines for the safe administration of high-dose interleukin-2. J Immunother 2001;24:287-93. Kirkwood JM, Manola J, Ibrahim J, Sondak V, Ernstoff MS, Rao U, et al. A pooled analysis of eastern cooperative oncology group and intergroup trials of adjuvant high-dose interferon for melanoma. Clin Cancer Res 2004;10:1670-7. Kirkwood JM, Ibrahim JG, Sosman JA, Sondak VK, Agarwala SS, Ernstoff MS, et al. High-dose interferon alfa-2b significantly prolongs relapse-free and overall survival compared with the GM2-KLH/QS-21 vaccine in patients with resected stage IIB-III melanoma: Results of intergroup trial E1694/S9512/C509801. J Clin Oncol 2001;19:2370-80. Kirkwood JM, Ibrahim J, Lawson DH, Atkins MB, Agarwala SS, Collins K, et al. High-dose interferon alfa-2b does not diminish antibody response to GM2 vaccination in patients with resected melanoma: Results of the Multicenter Eastern Cooperative Oncology Group Phase II Trial E2696. J Clin Oncol 2001;19:1430-6. Kirkwood JM, Strawderman MH, Ernstoff MS, Smith TJ, Borden EC, Blum RH, et al. Interferon alfa-2b adjuvant therapy of high-risk resected cutaneous melanoma: The Eastern Cooperative Oncology Group Trial EST 1684. J Clin Oncol 1996;14:7-17. Koppolu V, Vasigala VK. Role of Escherichia coli in biofuel production. Microbiol Insights 2016;9:29-35. Koppolu V, Osaka I, Skredenske JM, Kettle B, Hefty PS, Li J, et al. Small-molecule inhibitor of the Shigella flexneri master virulence regulator virF. Infect Immun 2013;81:4220-31. Linsley PS, Brady W, Urnes M, Grosmaire LS, Damle NK, Ledbetter JA, et al. CTLA-4 is a second receptor for the B cell activation antigen B7. J Exp Med 1991;174:561-9. Linsley PS, Brady W, Grosmaire L, Aruffo A, Damle NK, Ledbetter JA, et al. Binding of the B cell activation antigen B7 to CD28 costimulates T cell proliferation and interleukin 2 mRNA accumulation. J Exp Med 1991;173:721-30. Chen DS, Mellman I. Oncology meets immunology: The cancer-immunity cycle. Immunity 2013;39:1-0. Slaney CY, Kershaw MH, Darcy PK. Trafficking of T cells into tumors. Cancer Res 2014;74:7168-74. Skredenske JM, Koppolu V, Kolin A, Deng J, Kettle B, Taylor B, et al. Identification of a small-molecule inhibitor of bacterial AraC family activators. J Biomol Screen 2013;18:588-98. Koppolu V. Molecular Mechanisms and Inhibition of Transcription Activation by Bacterial AraC Family Activator Proteins. PhD diss., University of Kansas, 2013. Brunet JF, Denizot F, Luciani MF, Roux-Dosseto M, Suzan M, Mattei MG, et al. A new member of the immunoglobulin superfamily – CTLA-4. Nature 1987;328:267-70. Krummel MF, Allison JP. CD28 and CTLA-4 have opposing effects on the response of T cells to stimulation. J Exp Med 1995;182:459-65. Hodi FS, O'Day SJ, McDermott DF, Weber RW, Sosman JA, Haanen JB, et al. Improved survival with ipilimumab in patients with metastatic melanoma. N Engl J Med 2010;363:711-23. Robert C, Thomas L, Bondarenko I, O'Day S, Weber J, Garbe C, et al. Ipilimumab plus dacarbazine for previously untreated metastatic melanoma. N Engl J Med 2011;364:2517-26. Maio M, Grob JJ, Aamdal S, Bondarenko I, Robert C, Thomas L, et al. Five-year survival rates for treatment-naive patients with advanced melanoma who received ipilimumab plus dacarbazine in a phase III trial. J Clin Oncol 2015;33:1191-6. Eggermont AM, Chiarion-Sileni V, Grob JJ, Dummer R, Wolchok JD, Schmidt H, et al. Adjuvant ipilimumab versus placebo after complete resection of high-risk stage III melanoma (EORTC 18071): A randomised, double-blind, phase 3 trial. Lancet Oncol 2015;16:522-30. Ascierto PA, Simeone E, Sileni VC, Pigozzo J, Maio M, Altomonte M, et al. Clinical experience with ipilimumab 3 mg/kg: Real-world efficacy and safety data from an expanded access programme cohort. J Transl Med 2014;12:116. McDermott D, Haanen J, Chen TT, Lorigan P, O'Day S; MDX010-20 Investigators. Efficacy and safety of ipilimumab in metastatic melanoma patients surviving more than 2 years following treatment in a phase III trial (MDX010-20). Ann Oncol 2013;24:2694-8. Prieto PA, Yang JC, Sherry RM, Hughes MS, Kammula US, White DE, et al. CTLA-4 blockade with ipilimumab: Long-term follow-up of 177 patients with metastatic melanoma. Clin Cancer Res 2012;18:2039-47. Weber J, Thompson JA, Hamid O, Minor D, Amin A, Ron I, et al. A randomized, double-blind, placebo-controlled, phase II study comparing the tolerability and efficacy of ipilimumab administered with or without prophylactic budesonide in patients with unresectable stage III or IV melanoma. Clin Cancer Res 2009;15:5591-8. O'Day SJ, Maio M, Chiarion-Sileni V, Gajewski TF, Pehamberger H, Bondarenko IN, et al. Efficacy and safety of ipilimumab monotherapy in patients with pretreated advanced melanoma: A multicenter single-arm phase II study. Ann Oncol 2010;21:1712-7. Ribas A, Chmielowski B, Glaspy JA. Do we need a different set of response assessment criteria for tumor immunotherapy? Clin Cancer Res 2009;15:7116-8. Wolchok JD, Hoos A, O'Day S, Weber JS, Hamid O, Lebbé C, et al. Guidelines for the evaluation of immune therapy activity in solid tumors: Immune-related response criteria. Clin Cancer Res 2009;15:7412-20. Mahoney KM, Freeman GJ, McDermott DF. The next immune-checkpoint inhibitors: PD-1/PD-L1 blockade in melanoma. Clin Ther 2015;37:764-82. Vibhakar R, Juan G, Traganos F, Darzynkiewicz Z, Finger LR. Activation-induced expression of human programmed death-1 gene in T-lymphocytes. Exp Cell Res 1997;232:25-8. Freeman GJ. Structures of PD-1 with its ligands: Sideways and dancing cheek to cheek. Proc Natl Acad Sci U S A 2008;105:10275-6. Dong H, Zhu G, Tamada K, Chen L. B7-H1, a third member of the B7 family, co-stimulates T-cell proliferation and interleukin-10 secretion. Nat Med 1999;5:1365-9. Tseng SY, Otsuji M, Gorski K, Huang X, Slansky JE, Pai SI, et al. B7-DC, a new dendritic cell molecule with potent costimulatory properties for T cells. J Exp Med 2001;193:839-46. Agata Y, Kawasaki A, Nishimura H, Ishida Y, Tsubata T, Yagita H, et al. Expression of the PD-1 antigen on the surface of stimulated mouse T and B lymphocytes. Int Immunol 1996;8:765-72. Rodig N, Ryan T, Allen JA, Pang H, Grabie N, Chernova T, et al. Endothelial expression of PD-L1 and PD-L2 down-regulates CD8+ T cell activation and cytolysis. Eur J Immunol 2003;33:3117-26. Dong H, Strome SE, Salomao DR, Tamura H, Hirano F, Flies DB, et al. Tumor-associated B7-H1 promotes T-cell apoptosis: A potential mechanism of immune evasion. Nat Med 2002;8:793-800. Pedoeem A, Azoulay-Alfaguter I, Strazza M, Silverman GJ, Mor A. Programmed death-1 pathway in cancer and autoimmunity. Clin Immunol 2014;153:145-52. Freeman GJ, Long AJ, Iwai Y, Bourque K, Chernova T, Nishimura H, et al. Engagement of the PD-1 immunoinhibitory receptor by a novel B7 family member leads to negative regulation of lymphocyte activation. J Exp Med 2000;192:1027-34. Latchman Y, Wood CR, Chernova T, Chaudhary D, Borde M, Chernova I, et al. PD-L2 is a second ligand for PD-1 and inhibits T cell activation. Nat Immunol 2001;2:261-8. Mulagapati S, Koppolu V, Raju TS. Decoding of O-linked glycosylation by mass spectrometry. Biochemistry 2017;56:1218-26. Veerendra K, Veneela KV. Cancer immunotherapy arsenal: Current and promising new approaches. Cancer Ther Oncol Int J 2017;5:1-5. Keir ME, Butte MJ, Freeman GJ, Sharpe AH. PD-1 and its ligands in tolerance and immunity. Annu Rev Immunol 2008;26:677-704. Lutzky J, Antonia SJ, Blake-Haskins A, Li X, Robbins PB, Shalabi AM, et al. A phase 1 study of MEDI4736, an anti–PD-L1 antibody, in patients with advanced solid tumors. Journal of Clinical Oncology 2014;32:15 suppl, 3001. Hamid O, Sosman J, Lawrence D, Sullivan R, Ibrahim N, Kluger H. Clinical activity, safety, and biomarkers of MPDL3280A, an engineered PD-L1 antibody in patients with locally advanced or metastatic melanoma (MM). J Clin Oncol 2013b; 31:9010. Kamphorst AO, Wieland A, Nasti T, Yang S, Zhang R, Barber DL, et al. Rescue of exhausted CD8 T cells by PD-1-targeted therapies is CD28-dependent. Science 2017;355:1423-7. Wing K, Onishi Y, Prieto-Martin P, Yamaguchi T, Miyara M, Fehervari Z, et al. CTLA-4 control over foxp3+ regulatory T cell function. Science 2008;322:271-5. Peggs KS, Quezada SA, Chambers CA, Korman AJ, Allison JP. Blockade of CTLA-4 on both effector and regulatory T cell compartments contributes to the antitumor activity of anti-CTLA-4 antibodies. J Exp Med 2009;206:1717-25. Wang J, Yoshida T, Nakaki F, Hiai H, Okazaki T, Honjo T, et al. Establishment of NOD-pdcd1-/- mice as an efficient animal model of type I diabetes. Proc Natl Acad Sci U S A 2005;102:11823-8. Ueda H, Howson JM, Esposito L, Heward J, Snook H, Chamberlain G, et al. Association of the T-cell regulatory gene CTLA4 with susceptibility to autoimmune disease. Nature 2003;423:506-11. Khattri R, Auger JA, Griffin MD, Sharpe AH, Bluestone JA. Lymphoproliferative disorder in CTLA-4 knockout mice is characterized by CD28-regulated activation of th2 responses. J Immunol 1999;162:5784-91. Weber JS, D'Angelo SP, Minor D, Hodi FS, Gutzmer R, Neyns B, et al. Nivolumab versus chemotherapy in patients with advanced melanoma who progressed after anti-CTLA-4 treatment (CheckMate 037): A randomised, controlled, open-label, phase 3 trial. Lancet Oncol 2015;16:375-84. Lim JS, Soo RA. Nivolumab in the treatment of metastatic squamous non-small cell lung cancer: A review of the evidence. Ther Adv Respir Dis 2016;10:444-54. Strome SE, Dong H, Tamura H, Voss SG, Flies DB, Tamada K, et al. B7-H1 blockade augments adoptive T-cell immunotherapy for squamous cell carcinoma. Cancer Res 2003;63:6501-5. Kazandjian D, Suzman DL, Blumenthal G, Mushti S, He K, Libeg M, et al. FDA approval summary: Nivolumab for the treatment of metastatic non-small cell lung cancer with progression on or after platinum-based chemotherapy. Oncologist 2016;21:634-42. Nods for atezolizumab and nivolumab from FDA. Cancer Discov 2016;6:811. Younes A, Ansell SM. Novel agents in the treatment of Hodgkin lymphoma: Biological basis and clinical results. Semin Hematol 2016;53:186-9. Bracarda S, Altavilla A, Hamzaj A, Sisani M, Marrocolo F, Del Buono S, et al. Immunologic checkpoints blockade in renal cell, prostate, and urothelial malignancies. Semin Oncol 2015;42:495-505. Homet Moreno B, Ribas A. Anti-programmed cell death protein-1/ligand-1 therapy in different cancers. Br J Cancer 2015;112:1421-7. Topalian SL, Sznol M, McDermott DF, Kluger HM, Carvajal RD, Sharfman WH, et al. Survival, durable tumor remission, and long-term safety in patients with advanced melanoma receiving nivolumab. J Clin Oncol 2014;32:1020-30. Watanabe S, Kimura H, Takato H, Waseda Y, Hara J, Sone T, et al. Severe pneumonitis after nivolumab treatment in a patient with melanoma. Allergol Int 2016;65:487-9. Weber JS, Kudchadkar RR, Yu B, Gallenstein D, Horak CE, Inzunza HD, et al. Safety, efficacy, and biomarkers of nivolumab with vaccine in ipilimumab-refractory or -naive melanoma. J Clin Oncol 2013;31:4311-8. Robert C, Long GV, Brady B, Dutriaux C, Maio M, Mortier L, et al. Nivolumab in previously untreated melanoma without BRAF mutation. N Engl J Med 2015;372:320-30. Akbay EA, Koyama S, Carretero J, Altabef A, Tchaicha JH, Christensen CL, et al. Activation of the PD-1 pathway contributes to immune escape in EGFR-driven lung tumors. Cancer Discov 2013;3:1355-63. Frederick DT, Piris A, Cogdill AP, Cooper ZA, Lezcano C, Ferrone CR, et al. BRAF inhibition is associated with enhanced melanoma antigen expression and a more favorable tumor microenvironment in patients with metastatic melanoma. Clin Cancer Res 2013;19:1225-31. Curran MA, Montalvo W, Yagita H, Allison JP. PD-1 and CTLA-4 combination blockade expands infiltrating T cells and reduces regulatory T and myeloid cells within B16 melanoma tumors. Proc Natl Acad Sci U S A 2010;107:4275-80. Wolchok JD, Kluger H, Callahan MK, Postow MA, Rizvi NA, Lesokhin AM, et al. Nivolumab plus ipilimumab in advanced melanoma. N Engl J Med 2013;369:122-33. Abdel-Rahman O, Helbling D, Schmidt J, Petrausch U, Giryes A, Mehrabi A, et al. Treatment-associated fatigue in cancer patients treated with immune checkpoint inhibitors; a systematic review and meta-analysis. Clin Oncol (R Coll Radiol) 2016;28:e127-38. Eigentler TK, Hassel JC, Berking C, Aberle J, Bachmann O, Grünwald V, et al. Diagnosis, monitoring and management of immune-related adverse drug reactions of anti-PD-1 antibody therapy. Cancer Treat Rev 2016;45:7-18. Spain L, Diem S, Larkin J. Management of toxicities of immune checkpoint inhibitors. Cancer Treat Rev 2016;44:51-60. Hofmann L, Forschner A, Loquai C, Goldinger SM, Zimmer L, Ugurel S, et al. Cutaneous, gastrointestinal, hepatic, endocrine, and renal side-effects of anti-PD-1 therapy. Eur J Cancer 2016;60:190-209.
Zimmer L, Goldinger SM, Hofmann L, Loquai C, Ugurel S, Thomas I, et al. Neurological, respiratory, musculoskeletal, cardiac and ocular side-effects of anti-PD-1 therapy. Eur J Cancer 2016;60:210-25. Robert C, Ribas A, Wolchok JD, Hodi FS, Hamid O, Kefford R, et al. Anti-programmed-death-receptor-1 treatment with pembrolizumab in ipilimumab-refractory advanced melanoma: A randomised dose-comparison cohort of a phase 1 trial. Lancet 2014;384:1109-17. Ribas A, Pzanov I, Dummer R, Daud A, Schadendorf D, Robert C, et al. A Randomized Controlled Comparison of Pembrolizumab and Chemotherapy in Patients with Ipilimumab-Refractory (IPI-R) Melanoma (MEL). Late Breaking Abstract Presented at the 11th International Congress of the Society for Melanoma Research, 13-16 November, 2014, Zurich, Switzerland; 2014. Robert C, Schachter J, Long GV, Arance A, Grob JJ, Mortier L, et al. Pembrolizumab versus ipilimumab in advanced melanoma. N Engl J Med 2015;372:2521-32. Brahmer JR, Tykodi SS, Chow LQ, Hwu WJ, Topalian SL, Hwu P, et al. Safety and activity of anti-PD-L1 antibody in patients with advanced cancer. N Engl J Med 2012;366:2455-65.